Bowling Green is striving to have a second half of the season just like its first half. Entering a three-week break, the Falcons are 11-3-2 overall and 8-1-1 in the Western Collegiate Hockey Association. They’re ranked 13th nationally and have the best winning percentage in WCHA league play. BG is idle until Jan. 3-4 when it faces No. 17 Robert Morris in a nonleague series. After facing RMU, the Falcons will finish the regular season with nine straight WCHA series. “For college kids, the break comes at a good time,” BG coach Chris Bergeron said. “It’s good for them to get away and come back refreshed. BG is hoping to host a playoff series for the second straight season. The top four teams host quarterfinal series in the 10-team league. The Falcons are third in the league with 17 points, three behind both Minnesota State and Michigan Tech. BG has played two fewer games than those teams. “Our challenge is to carry that over for 10 weeks and hopefully much longer in the second half of the year,” Bergeron said. “Our second half is hard. It’s going to be a challenge to build off of our first half because the first half was really good. PART II: BG has steadily improved after Christmas in each of Bergeron’s first four seasons. The Falcons are 22-18-3 overall and 15-13-2 in league play after Christmas the last two seasons. During the 2011-12 season, they won more games after Christmas than they did before Christmas, even though they finished with a losing record. “The second half has meant let’s not give up on this, let’s not quit,” Bergeron said of the last four seasons. SCHEDULE: BG has a favorable league schedule remaining, although it still has three long trips — Alaska-Anchorage, Bemidji State and Michigan Tech. Just two series are against the top four teams in the standings — at Tech and at home against Northern Michigan. The Falcons have one series each against the bottom five teams in the league. They host Alabama-Huntsville, Alaska (Fairbanks) and Lake Superior, and visit Bemidji and Anchorage. 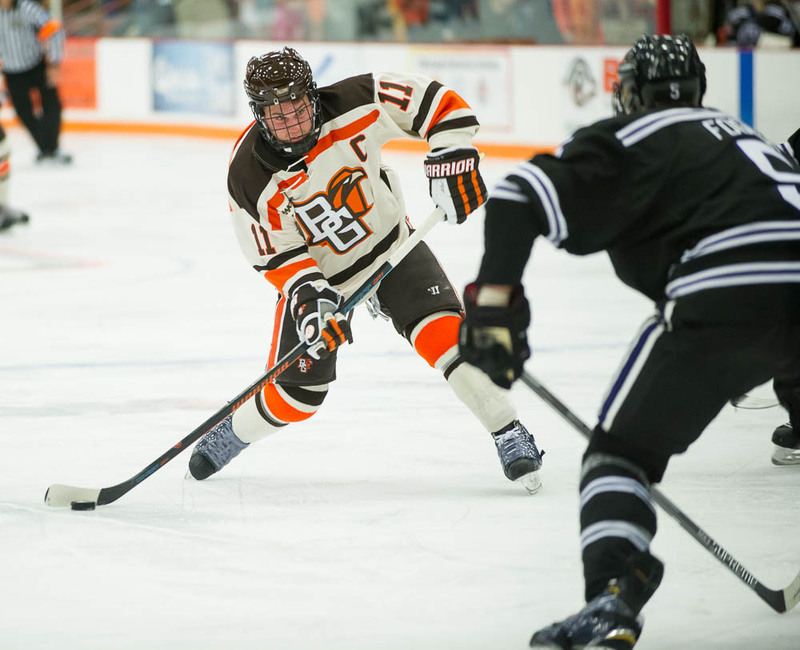 The Falcons have two series against Ferris, second in the WCHA coaches poll. BG and MSU don’t play again during the regular season. They split a series at BG Oct. 31-Nov. 1. 20: The Falcons are bidding for their first 20-win season since the 1995-96 campaign when they were 24-13-1. BG’s most wins since then is 17, that coming during the 1996-97 season when the Falcons were 17-16-3. STREAKING: The Falcons’ five-game unbeaten streak (4-0-1) is tied for the second-longest active streak in the country. Harvard has won six straight, while BG, Holy Cross and North Dakota all are 4-0-1 in their last five games. BG is 7-1-1 in its last nine games, including a 6-0-1 record in its last seven league games. SHOLL: Bergeron isn’t concerned about sophomore goalie Tomas Sholl, who was brought into replace Andrew Hammond. Hammond was a four-year standout and is currently in the Ottawa Senators’ organization. Sholl hasn’t played since Oct. 31 when he allowed five goals on 34 shots during a 5-2 loss at home to No. 3 Minnesota State. Sophomore Tommy Burke and freshman Chris Nell have started the last 11 games. In three games, Sholl has a 2.67 goals-against average and an .897 save percentage. He made 22 saves Oct. 9 in a 3-2 win over No. 6 Miami in the Ice Arena. “I don’t think he’s played poorly,” Bergeron said. “To this point, Tommy and Chris have played better. That’s been the message to Tomas. A three-man competition where only one plays … that makes it difficult. We’re not concerned at all. Burke and Sholl split BG’s goaltending duties most of last season until Burke emerged as the No. 1 netminder down the stretch. In 12 games last season, Sholl had a 2.68 goals-against and an .896 save percentage. “Is the conversation over? No,” Bergeron said of BG’s goaltending. “Our biggest concern with Tomas is to stay on him and make sure he realizes he is still part of this conversation. BUSY: While BG is off until January, RMU has four games in that span. The Colonials visit Mercyhurst this weekend in an Atlantic Hockey series, and co-host the Three Rivers Classic with Penn State. RMU plays Penn State Dec. 29 and Western Michigan or No. 14 Colgate Dec. 30.